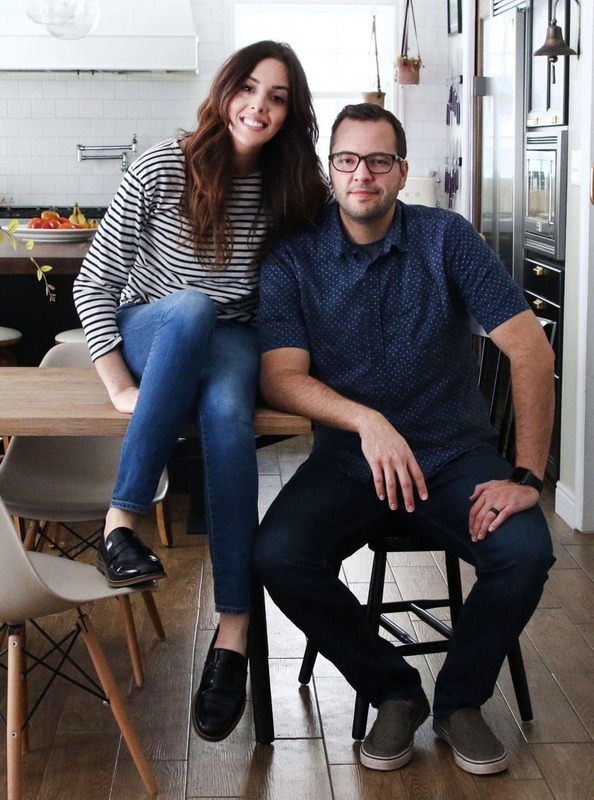 We really wanted wall-to-wall thicker solid wood shelves that maybe looked like they were floating, but not necessarily are–since you can’t very easily achieve that with solid wood. We are so pleased with the results! Of course, now we can fill them up with books and some accessories, but before we do that we wanted to give you a full breakdown of what we used and what we did in case you wanted to do something similar in your home. And why wouldn’t you!? We special ordered the boards because we wanted them a little thicker, and we wanted squared edges. We were pleasantly surprised at how inexpensive they were. Even still, the ends were a little rough and uneven, which we expected, so the first step was to square the edges and cut them to fit on the wall exactly. For this, we used a miter saw. The blade wasn’t big enough to cut through the whole board (wah wahhh), so Chris cut half, flipped the board, lined up the blade with the first cut, and finished cutting through. Even though we wanted the shelves to look like they were floating (ie, no visible brackets), we knew that would be difficult to achieve with the size of boards we were dealing with. The boards were really heavy. So we picked up these 2 inch metal angle brackets. These worked perfect, because they were short enough to hide behind the 2.5 inch boards, but strong enough to hold the weight without bending. Something this short wouldn’t work if just holding from the back wall, but since we were putting the shelves wall-to-wall, we could have one bracket on each end to prevent the boards from sagging forward. So after cutting the boards to size, we measured the wall and found 3 somewhat evenly-spaced studs that we could connect the brackets straight into. Unfortunately, there weren’t any studs where we needed them to be on the sides, so we found some heavy-duty wall anchors, each rated to hold up to 75 pounds. We would have two anchors supporting each side bracket (a total of 4 anchors in the 2 side brackets for each board), and coupled with the back-wall brackets mounted directly to the studs, this would give us plenty of support. After taking the measurements and deciding where the brackets would mount on the back wall, we marked these locations on our boards and routed spaces out so the brackets could set inside the boards, making them flush and less visible. You need to take the measuring part of this step serious, because the brackets are hung on the wall before you place the shelves. This means your routed out spaces need to match perfectly with where the brackets are mounted. We’ve all heard the advice to “measure twice, cut once.” Well with this, measure 5 or 6 times, pray like mad, and then cut. After deciding the best way to stain the boards (you can read about that here), we sanded them smooth with a palm sander, equipped with 100 grit sandpaper–being careful not to over-sand, because that can impact Douglas Fir’s ability to accept stain. So we took our time to get it right. The gel stain we mentioned earlier this week worked perfectly. We spread it on nice and thick, wiped it off with rags and paper towels, and let each coat cry for 8 hours. We did two coats of stain, plus a layer of water-based satin polycrylic–which gives off a nice low-lustre sheen. Nothing too shiny, just protects. Once the shelves were cut, sanded, routed, stained and sealed, we only needed to get them mounted. Our friends at Ace Hardware sent over a heavy duty 18V DeWalt Impact driver for us to try out. We weren’t sure what to expect when comparing it to our standard drill that we’ve been using for the past three years, but, well, have you ever used an impact driver? We were dealing with solid wood and studs and it was like butter. In fact, the first stud Chris drove a bracket into, he thought he missed the stud! It was effortless. We are working on putting together a giveaway with Ace Hardware because these are one of those game-changer tools we can’t imagine living without. Stay tuned. It’s good. They matched up. Perfectly. Cue sigh of relief. The hard part was over. The shelves were level. The last step was just driving 3/4″ screws into the underside of the shelves to secure them in place. And then stand back and pat ourselves on the back. We have spent every other minute, just sitting on the couch looking at our pretty, empty shelves. But this weekend we can’t wait to load them up and wrap this room up–for now. Happy Weekend to all of you! To read more about the transformation of our reading room, click here. We are one of the 8 bloggers on the Ace Blogger Panel and this post was in collaboration with Ace Hardware. They sent us the impact driver to try and review and we’re currently working on a giveaway for all of you (as soon as it gets back in stock!). All opinions and words are our own. Promise. Love these shelves! I’ve been inspired by these shelves, and I keep coming back to them after 3 years of following you guys! AND finally now is the time to get these awesome shelves up in our home!! I’m so excited!! Quick question for you — how far apart did you space your shelves?? If you had placed the anchors, and placed the shelf on top, couldn’t you have marked the shelves and then routed? Just curious if this would work too because I don’t trust myself. Sure! You could do it that way. Because of the difficulty of getting our shelves in place I didn’t want to do it more than once and scrape up the walls, but you could for sure do it that way. We’ve done something similar.. the o my problem is that the brackets are slightly visible (as they are shiny silver). How did you guys cover them up? Ours are visible if you look close, but not very obvious. If you want to cover it up, you could paint it with a similar color to help it blend. Hi! We are planning to hang solid wood bookshelves too, but not between two walls. We would use solid wood on the ends too to make a frame and to strengthen. What I’m worried about is that it may not bear the weight of the books with those little brackest, so I’m writing you to ask if it works for you now, as it is loaded with books? It works great – the main factor there is the strength of the wood. With beams as thick as we have, it holds up really well. 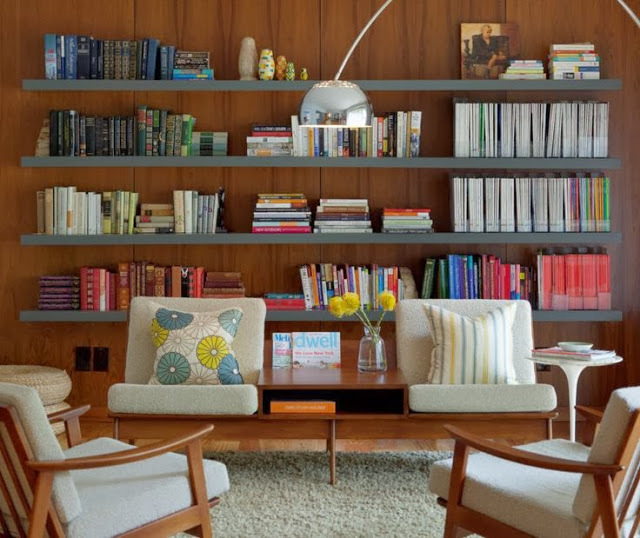 Love your reading room shelves! Can you detail the spacing of them….how far apart on the wall, from floor and ceiling??? We are looking to do something similar in a corner of our living room, but would only have 2 walls (the back and one end) to attach the shelf to, about 7.5-8ft long. Do you think this L-bracket method would still suffice? Additionally, the wall we would be mounting to is plaster. Any advice? Definitely not a great situation. I wouldn’t use these short L-brackets, for sure. You’d need much, much larger ones, attached directly to the studs, then plastered over to be hidden and make the wall seamless. Would it be possible to use these L brackets without using a router? I’m guessing that’s just what makes it look more like they’re floating, but does it have any structural effect? I’m planning to recreate on my 12ft wall. Do you think 4 back-wall brackets? Put a bracket wherever there’s a stud. How much weight do you think each shelf can hold? I want to use them to hold just books and I’m a little nervous. If you can get the side supports into studs, I’m sure they would hold books wall-to-wall. But if you’re using anchors on the sides, you’ll want to reduce the load a bit. Your shelves are beautiful! I’m wondering if I did something similar for one of my rooms, would the shelves hold all books? How much weight do you think they’ll hold? We did this, this past weekend and LOVE how they turned out. Thanks for sharing! working awesome years and years later. They look great. I picked up Douglas fir boards to build similar shelves. I’m wondering if yours are flush wall to wall, or if you left an expansion gap? Or, maybe you notice expansion or contraction with different humidity levels? Thanks. I’m a CLJ blog devotee…thanks for all you do! You inspired my kitchen remodel I just realized as I wrote this, ha! I have a question about the thickness of this wood, is there a reason you chose the 2.5 in? Our wall is about the same width, but we were looking at possibly using 1 5/8 in x 10 ft boards. Any reason you think that would not work either from a design perspective or for the stability of the shelves? It would totally work! We just wanted a more chunky look. Thanks! One more question. Do you remember if the wood you used was green or kiln-dried? What color is the paint on the walls? Love!! If I have just one side wall do you think these L brackets would be strong enough on three walls only? I’m going to be using them for books. The shelves will be 33” wide. I’d be nervous not having any support on both ends of the shelves. This shelving has inspired me to do it for our now finished basement! Except I couldn’t find douglas fir. Went to the closest lumber yard and Home Depot and they both said that spruce wood would work. I ended up buying it but am now getting a differing opinion from our contractor regarding the wood warping if used inside a warm house unsupported. Any knowledge/advice on whether or not this wall-to-wall shelving would work with spruce wood? This looks awesome, and it’s exactly how I want it done. I’m wondering how would this work on a little longer wall. Our wall is 11’6″ long, so please tell me if I should use the same wood thickness. Yeah I wouldn’t go any thicker – otherwise it begins getting so heavy that it may be even more prone to sagging. For a span that long, you may want to use angle brackets a little larger than what we went with, but as long as you are anchored into studs along the way you should see minimal, if any, sagging. Hi Julia, How far apart did you space your shelves? We are about to put some floating shelves in ourselves and love yours. Thanks! 4 years later just curious how the shelves are holding up? Are they sagging in the middle from the weight of books and decorations??? Just kidding. Wood that thick probably doesn’t even need the brackets if you could just put two long screws in to studs. These are still going strong! So impressed with how this turned out! I love the paint color, do you know the name? Hi! Curious to know how these are holding up . . . thanks! The before and after on this room is astounding ! How much space did you leave between each shelf? Also, what is the distance from the floor to the bottom shelf? I’ve spent a year being incredibly inspired by this room. I think my husband and I are ready to use this inspiration to tackle a room in our house that needs some serious charm. I have been trying to replicate this for floating shelves in our kitchen, but all the lumber yards near me are quoting me $30 per linear foot – you got yours for $33 for each 10′ board, am I reading that correctly? Hi! Love this look and thanks so much for all the details! How far apart did you space your shelves? When you say you ordered the wood….where? What type? 1 – Wouldn’t it have been easier to mount the brackets, Then put the shelves in place temporarily, mark the spots where they needed to be routed, take the shelves off, rout, then screw the shelves in place? Seems better than holding your breath to make sure your measurements were correct. Although I would have done the above and measured too. 2 – Call me a contrarian, but I would have preferred the shelves left unstained and just sealed. I like the look of unfinished wood. I don’t like the stained look next to the dark walls. But judging from the comments, I am a minority of one here. Otherwise, I think the room looks great. Do you have a pic of the shelves with books on them? Hi! We are tackling this project in our study. Can you give me an idea of how fart apart your shelves are spaced? Thanks! I’m curious how your shelves have done over the years since you installed them? Are they holding up to the weight of all the books? We are looking at a similar project and I’m concerned about whether the front of the shelves will need additional support. We’ve had no issues, we love them and they are still going strong. We love these shelves. We are planning on putting up some just like this. Where do you purchase the wood? We got the wood at a local lumber yard. I was curious on how the shelves are holding up. Also if there is anything you would’ve done differently. Has the weight of the books been an issue? Wanted to thank you guys for posting this. We did something similar in our living room and thanks to your detailed pictures, I was able to show my “men” EXACTLY what I wanted…and that it was feasible! what tools do you use to rout out the spaces for the brackets? I have a hard time trusting that much wood to such a small bracket. A year and a half later, how are they holding up? I was wondering about making free standing shelves like this to hold multiple betta tanks. I want to do the sides painted and a painted back without making it look like cheap shelves from the store. The shelves would be about 20″ wide about 10-12″ deep and would hold about 15-25 lbs each. Can you give me any tips about thickness and would I use Douglas for on the sides too? I just saw this on AT and had to comment! I love this! Good job guys! This is EXACTLY what I am planning in my living room, same color wood, everything! Thanks so much for the step by step and the info on the wood you used. I went to local hardware store and couldn’t make up my mind which type of wood to use or dimensions. I was also concerned as to how I was going to make it look like a floating shelf. This has definitely given me a better grasp of exactly what I need to do. Looks great! Thanks for this great tutorial! I’ve been wanting to do almost exactly the same project and this is so so so helpful. What tool did you use to route out the spots where the shelves sit on the brackets? Specific brand and tip sizes would be really helpful!!! The router we used is a Craftsman plunge router with a digital display and went down 1/8″. We used the smallest, flattest bit. Hope that helps! Looks really great! Would love to know what the paint color is. This is beautiful and so creative! What paint color did you use? Oh wow! That looks absolutely amazing. I love everything about that… the colors work so great together. I’m now thinking where in my house can I do that? Holy wow. Those look fantastic! Are you at all concerned about the weight of the shelves and the weight of books combined with the “L” bracket mounts? I’ve been wanting to put shelves in a niche in my dining room to hold cookbooks, liquor bottles, glasses & cups, etc. and I’ve been struggling with how to mount them in a way that doesn’t look like IKEA shelving but that is safe and stable. I’m seriously thinking that if you’re comfortable with these thick, heavy shelves holding books, I shouldn’t be concerned about my shorter shelves holding a dozen bottles or my cookbooks. We aren’t in the least concerned about the weight of these shelves on the L brackets for a couple reasons. First, they are mounted into 3 studs, but the addition of the L-brackets supporting the sides are really putting us at ease. are coming out. Even the wood thing on the coffee table…. The room looks amazing. 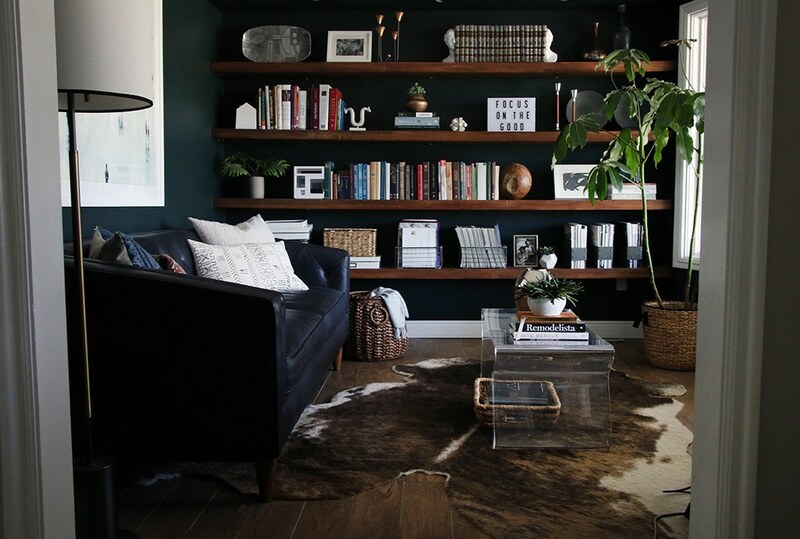 Love the shelves, the color, all the lighting, the warmth of the sofa and pillows. Can’t wait to see the finished project! Looks SO good. I have loved seeing your style develop over the last year or so – I feel like you’ve totally got it sussed! Beautiful. Gorgeous. We are wanting to do something similar in our office: chunky wood, wall to wall, looks like they’re floating. But I’ve been a bit stumped. Thanks for the heads up! It looks like they were meant to be there. Fabulous!!! This room looks amazing! I love the shelves, the color, and the lights! Looking good! 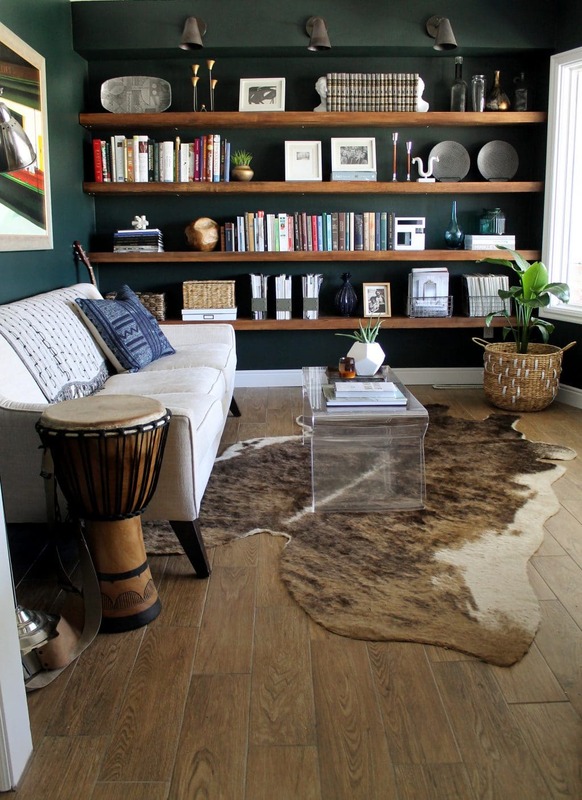 Love the color stain with those fab green walls! I’m SUPER impressed that you took the time to route out the places where the L hooks would go! The attention to detail is impeccable. Excelente, Marcums! This is stunning. I’ve already showed the picture to my husband and told him we need to do this in the weird recessed area that was left in our living room after we ripped out a horrible built in desk! This would be absolutely perfect for that spot! Need to do this. So thanks for the good instructions!! Whoa whoa whoa!! Beautiful! Seriously,that wall color is amazing with the stain on the shelves. At first I was doubting those little brackets, but then I saw you put two on each end and my fears went away. Can’t wait to see how you fill them! Books books books!! Jealous! They look beautiful!! I’d would love to have that room in my home. It has come together quite nicely! Good job guys! Love the shelves, LOVE this room!